Halloween is one of the better holidays for a language lesson as it offers up a whole lot of fun, weird, and bizarre images and vocabulary. It’s great for picture-vocabulary matching and word-sorting exercises, It’s also a pretty interesting discussion topic and questionnaires and surveys could also work well. 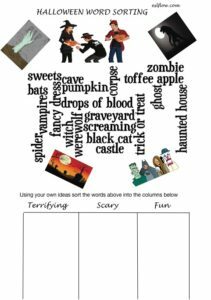 Halloween related words and phrases to the pictures. Click on the image below or the link at the side to download the PDF file. Halloween related words into the suitable categories: terrifying, scary and fun. 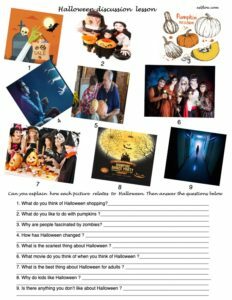 This is a Halloween discussion lesson. Students explain how the pictures relate to Halloween and then write answers to the questions. This is a Halloween brainstorming exercise. Students brainstorm the things they like and dislike about Halloween.